This unique ecru flat card designed features a vase filled with a beautify watercolor bouquet of flowers. 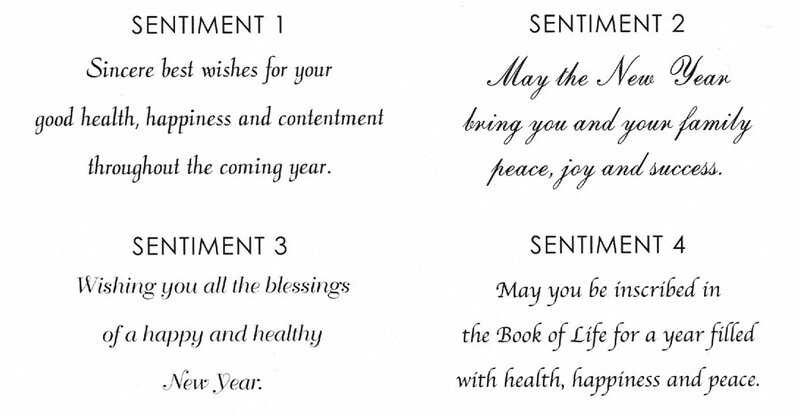 The inscribed blessings throughout the artwork offer a multitude of warm wishes for the New Year Wish your family and friends a joyful new year with this elegant and joyous greeting card. You choose the sentiment and specify your signature lines, which will be printed in the same typestyle as the sentiment you choose. Your greeting and signature will be printed using flat in black ink as shown. You can keep the sentiment shown or choose any of the standard sentiments at no additional charge. You can also create your own custom sentiment for an additional charge. You may choose to add a Hebrew sentiment at no charge. If you choose to add a Hebrew sentiment it will appear above the English sentiment. Ecru envelopes included with cards. You can change to any available envelope color for an additional charge. Can be flat printed on the back of the envelope in black ink for an additional charge.